Did Tim Cook just reveal when Apple AirPods will ship? After delaying its stylistically questionable AirPods earbuds, many were left wondering just when Apple would ship the audio accessory designed for the headphone-jackless iPhone 7 and iPhone 7 Plus. We may now have an answer - of sorts - from about the most legit source you can get: Apple CEO Tim Cook. An alleged email exchange between Apple's head honcho and a customer was sent to MacRumors. The customer demands an AirPods release date, writing they'd like to know so they can decide whether to buy another pair of wireless headphones or not. Cook's supposed response (emphasis ours): "Thanks for your note. Sorry for the delay---we are finalizing them and I anticipate we will begin to ship over the next few weeks." 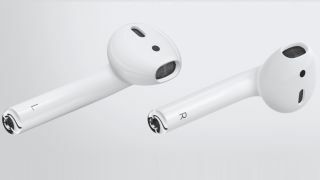 "The next few weeks" leaves much to interpretation, though based on another leak that AirPods will start shipping in December, maybe, just maybe, the headphones will be ready in time for the holiday shopping season. MacRumors said it was able to verify that the email's full headers came from Apple's company servers, and Cook is known to respond to customer emails. Still, the validity of the email should be held in question as the whole thing could be a fake. We've asked Apple for an update on the AirPods release date, and will update this story if we hear back. Apple held off on releasing the headphones because it needed "a little more time" to get them ready. It's been radio silence since then. Retailing for $159/£159 on Apple's store, AirPods are listed as "currently unavailable" if you try to purchase a pair. If, like the customer who emailed Cook, you are tired of waiting for AirPods, we have a few wireless headphone suggestions to tide you over.